Note to the reader: Small intestinal bacterial overgrowth is often abbreviated as SIBO, but because the focus of this article is on small bowel obstruction, which is abbreviated as SBO, I have chosen to not use the former abbreviation for the sake of clarity. In February 2015 I was diagnosed with a small bowel obstruction (SBO), secondary to lymphoma. An enlarged lymph node was encroaching into the luminal space of the intestinal wall, causing an intussusception whereby the small bowel starts to telescope into itself. This blocks the passage of food and drink, resulting in severe abdominal pain, nausea, and vomiting. I had been having intermittent acute episodes of pain throughout that winter, but a CT scan in the emergency room is what finally diagnosed the cause. I was admitted to the hospital to begin my cancer journey, but the initial treatment for the partial bowel obstruction was to not eat or drink while being fed intravenously for a few days. This eliminated the pain, and after the blockage worked itself out I was released from the hospital. Now, after two years in remission, I still suffer from acute episodes of moderate to severe pain reminiscent of the pain of a bowel obstruction. As all my follow-up CT scans (at least one of which directly followed an acute episode of pain) over the past two years have remained virtually unchanged, I am left with the unfortunate conclusion that my bowels have been altered in a way that results in chronic episodes of partial bowel obstructions, likely due to deep adhesions in the spaces the lymph tumors once occupied. After consulting with multiple physicians, including two different gastroenterologists, I was dismayed by the lack of treatment or palliative advice from conventional medicine practitioners. The best they can offer is to wait for an SBO to become severe before operating and hope the procedure itself does not land the patient back in the emergency room. Because the SBO was partial, I was lucky and dodged surgery. Although surgical intervention is lifesaving for a complete bowel obstruction, there is the extremely unfortunate side effect of causing further bowel obstructions due to the additional formation of scar tissue. Hoping to prevent the weak area of my intestines from getting to that level of severity, I have researched and implemented a rigorous holistic protocol to minimize the frequency of episodes of SBO and help alleviate them when they do occur. Before discussing those treatment strategies, I wish to first state the axiom of my observations of living with an SBO over the last few years: Peristalsis is your friend—until it isn’t. In essence, you want to do everything you can to support natural and uninhibited movement of the intestines until the first sign of abdominal pain that indicates you may be having an episode of SBO. In my case, dealing with episodes of a partial obstruction, I have a pattern of pain and nausea that are my early warning signs. If you experience similar telltale signs, the most important thing you can do at this point is stop eating and drinking. Fasting and waiting it out prevents the backup from worsening until your body has a chance to move things through your system. Eating and drinking will only serve to increase intra-abdominal pressure as peristalsis of incoming material comes up against the existing blockage. If this advice is not heeded, the body will redirect the food back up causing nausea and vomiting. That said, we need not wait until symptoms appear to be proactive and prevent a possible episode. Although there are clear mechanical reasons why an SBO may occur (such as scar tissue secondary to abdominal surgery), there are other predisposing factors we can influence. The best strategy I have found is movement. One of the more pronounced episodes of SBO pain I’ve experienced came a few days after a minor surgery for which I was on bed rest a few days. Normally I exercise every morning, am on my feet during work, and walk on breaks. All this came to a grinding halt during those few days of recovery as I had to cease several elements of my normal self-care. I then woke up in pain early one morning and knew I was in for a long day. That episode lasted 10 hours. Most episodes of SBO that I have endured came on at night, either waking up from a sound sleep or first thing in the morning with pain. Standing, walking, and exercising all leverage gravity and motion to assist peristalsis. During overnight inactivity and fasting, intestinal movement is limited to the slow microbe-cleansing wave of the migrating motor complex (MMC), an undulating wave of peristalsis that occurs in an empty bowel (mostly overnight while fasting). If this aspect of physiology is impaired by adhesions from surgery or at the site of a former tumor, then tension and inflammation may build and result in the pain and pressure of an acute episode of SBO. I have not found a way to exercise while sleeping, and furthermore, sleep needs to be a quiescent time of rejuvenation. All we can do is remain active during our waking hours, particularly first thing in the morning and after meals. My routine has thus been bouncing for 10-15 minutes on a mini trampoline (known as a rebounder) as a way to create a surfeit of movement through the abdomen. Such a short period of low intensity is all that is required; one need not sweat profusely to restore a gentle flow of circulation throughout the body. It is also important to recognize and remediate long periods of stagnancy during the day, typically from sitting too long. Consider a standing or treadmill desk for office work, or take regular breaks to walk and stretch. Remember to take movement breaks if driving long distances. When I get up from a period of inactivity, I tend to intuitively twist my torso and gently bend backward at my midspine to open and stretch the abdominal cavity. Slow and rhythmic belly breathing causes the diaphragm to gently extend downward into the abdomen, positively affecting abdominal peristalsis with each inhalation. When it comes to diet, there are several key strategies to consider for an individual with a history of SBO. The most helpful is to avoid overeating, which is second only to a lack of movement as a factor precipitating an episode of SBO pain. The quick influx of material into the opening of the small intestine from a large meal can exacerbate an already stressed and weak section of the intestine. I’ve experienced many an episode of minor to severe pain following a large dinner leading into the inactivity of night. For this reason, those who suffer from SBO may find they do best grazing throughout the day instead of eating large meals. I find this difficult as I prefer the rhythm of eating then abstaining, especially as this reinforces periods of cleansing in the intestine via the MMC. Furthermore, on busy workdays I don’t have the time or desire to snack between treating patients. My compromise is to eat modestly and snack as hunger dictates, typically with liquid calories so as not to overly burden digestive function. Homemade bone broth with a pinch of salt is my favorite. It provides some calories between meals while delivering a solid dose of gut-healing gelatin. After being discharged from the hospital, where my only nutrition was intravenous fluids for three days, I returned home and instituted a liquid diet for a week, followed by a blended-food diet for three weeks. I did not have any flare-ups of pain during this time, so I knew that limiting my food intake to modest portions of easily digested foods was going to be a helpful long-term strategy. As I began reintroducing foods, my breakfast was always a smoothie. I needed a solid source of calories that would be easy to digest before oncology treatment could shrink the tumors that were causing my bowel obstruction. I’ve continued making a smoothie almost every morning since but now think of it as a gentle way to reintroduce food after the overnight fast. Even though blended foods are predigested, I still “chew” my smoothie to encourage the release of enzymes that further break down the proteins, carbohydrates, and fats. This brings up another important but often overlooked feature of healthy eating: chewing thoroughly. Along these lines, anything you can do to aid digestion is a worthwhile strategy for prevention of complications from an SBO. If you suffer from indigestion, this is an unambiguous sign from your body that digestion is impaired. Consider herbal bitters or raw, organic apple cider vinegar to stoke the digestive fire. Following my breakfast smoothie and a midmorning cup of tea, I go on to consume my largest meal at midday when digestive vigor is at its strongest, eating most modestly at dinner and snacking between if needed. This follows the rhythm of many wise cultures worldwide who eat more (and rest) around midday and less in the evening. I also avoid snacking at night as there are clear benefits to extending the overnight fasting period. Intermittent fasting (skipping a meal) is a healthy practice and gives the digestive system a sizable rest period, provided an individual with a history of SBO does not break the fast with a large meal. Famine then feast is not a friendly routine when living with an SBO. A more gentle strategy is time-restricted eating; instead of skipping a meal, move it either later (for breakfast) or earlier (for dinner) to give a longer period of overnight fasting. When doing so, aim for a period of 12-14 hours without food consumption overnight. (Water is OK.) For example, if you eat breakfast at 7 a.m., finish your dinner by 5 p.m. and don’t snack thereafter to successfully establish a 14-hour window for the gastrointestinal system to rest. After consideration to the size and timing of meals, pay heed to the nutrition and quality of your food and drink. Avoid empty calories and strive to get as much nutrients per calorie as possible, a notion known as nutrient density. The higher quality and more nutritious your meal, the more satisfied you will be and the less your brain will signal you to eat in order to get what it needs. Get by with less on a diet devoid of processed foods and rich in healthy fats to augment satiety. Pay particular attention to foods that make you feel bloated, gassy, or inflamed. Educate yourself on the proper preparation of grains, nuts, and seeds, if you choose to eat them. Avoid inflammatory foods; if you are unsure what foods may be triggering an immune or inflammatory response, consider an elimination diet to discover if reintroduced foods cause any symptoms, digestive or otherwise. Anything that weakens digestion (even if minor) will make your more susceptible to an SBO. Keep in mind that foods such as nightshade vegetables and certain lectins such as gluten in wheat, spelt, and rye tend to be inflammatory for many people and are best avoided to optimize digestion. An elimination diet will help clarify if you can tolerate these foods and remains the gold standard for testing. However, certain labs can reveal potential food sensitivities based upon advanced analysis of blood, and the results can be used as a collaborating measure. Just as surely as certain foods can hamper digestion, others can enhance it. Fermented foods and beverages such as raw sauerkraut and kombucha are rich in enzymes and probiotics, strongly aiding digestion. Consume these foods regularly and with meals, or consider a probiotic supplement with specific strains that are suggested by research to increase gut motility. Find your power foods and let them strengthen you. Expand your dietary repertoire to include beverages that support digestion and heal the gut. In addition to kombucha and bone broth, herbal teas can also be a significant ally; ginger, peppermint, and chamomile can all be helpful for calming the gut. Try each to see which best fits your constitution. Beet root enhances elimination, as is true of many fiber-rich foods. Although certain forms of fiber in many healthy vegetables are indigestible (insoluble) and may pose an increased burden on the intestines, the fact that these fibers are prebiotic (feed healthy gut flora) and enhance elimination should not dissuade you from their use if you are not currently experiencing any pain or problems from an SBO. A low-residue diet devoid of fiber is often prescribed by gastroenterologists to minimize intestinal backup. While this and a blended-food diet are essential during an acute episode of SBO (although I prefer fasting and a liquid/blended diet), prebiotic fiber helps restore gut ecology and, counterintuitively, hampers the overgrowth of bacteria in the small intestine when paired with probiotics. More on that subject later. So far we’ve detailed treatments that work from the inside out and rely upon body awareness. You need to be tapped into the messages of your body to reveal which foods make you feel stronger and which weaken you. You need to have a clear sense of boundaries at the dinner table and stop eating when you are 70-80 percent full. Small sensations of discomfort belie larger imbalances. Heed those messages as your first line of prevention. Next we turn to external therapies to address the health of the gut from the outside in. What I have found to be the most helpful in this regard is the application of heat to stimulate circulation and enhance movement within the gut. I have a professional heat lamp at home (the same as I use at the clinic) that I position over my belly on most nights while resting in bed and before going to sleep. The heat lamp feels lovely, but a hot water bottle will do just as well. If the weight of a filled water bottle doesn’t feel good on top your belly, lay on your side and sandwich the water bottle between you and a pillow to hold it in place and conserve heat. Taking a shower allows for a unique opportunity for hydrotherapy where you alternate hot and cold water blasting on the abdomen. Switching to cold can be startling, but the change in temperature is a strong promoter of circulation. Always begin with heat and end with cold within the cycles of alternating, and try to work up to a minute or so of water as hot as you can stand and 15-30 seconds of water as cold as it will go. Another fantastic heat therapy is the castor oil pack. Used topically over the abdomen, castor oil benefits circulation, detoxification (particularly of the lymphatics), and elimination. You will find many different permutations of instructions for applying a castor oil pack, but most involve soaking a flannel cloth in lightly warmed castor oil (typically in the oven in a heatproof pan), laying the cloth on the abdomen, and covering the area in plastic wrap before adding a hot water bottle over the top. This should rest in place for 20-30 minutes. The key elements are the castor oil and heat. Because I have no love for plastic wrap, I typically do a lazy version of applying a thick layer of castor oil by hand (skipping the cloth) and warm the area by laying in a sauna. It is a less concentrated approach, but because it doesn’t require as much effort, I do it more often. Chamomile essential oil rubbed on the belly is a great topical for acute cramping in the abdomen. For sensitive skin, it’s best to dilute the essential oil in a carrier such as coconut oil and test for sensitivity by applying one drop to the inside of your wrist. If there are no skin reactions after an hour, dilute a few drops in a carrier oil and apply to the abdomen as needed. In addition to topical therapies, visceral manipulation is a broad umbrella of therapies that aim to relax the tissues of the abdomen and release adhesions that, as the name implies, adhere areas of the intestines to the fascial layer of the abdominal cavity. There is a chain of physical therapy clinics in the United States that attempt to resolve bowel obstruction pain through a specific technique to break up adhesions in the abdomen. Though I can’t verify this clinic’s claims, some form of manual therapy may be worth exploring, depending upon your history and presentation. Osteopathic physicians are trained in osteopathic manipulation technique, and some massage therapists complete advanced coursework in myofascial therapy. Both are valid means of visceral work. Acupuncture and moxibustion (a traditional Chinese medicine form of heat therapy) are also indicated for the resolution of scar tissue. Finally, we come to perhaps the most overlooked factor disturbing gut health: stress. Unremitting mental and emotional stress results in chronic elevation of the adrenal hormone cortisol and that can lead to a breakdown in gut integrity. We must be attuned to the fact that suffering in our gut is not only about what we are eating but about what is eating us. Adopting a program to mitigate stress, seeking counseling, and learning coping strategies can all help calm the gut. 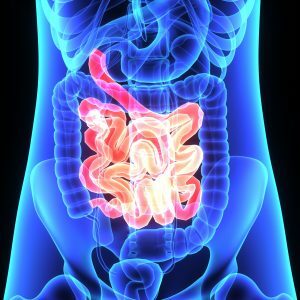 The most frustrating yet enlightening part of my journey was discovering that patients with a history of SBO may be more susceptible to bowel changes that in turn can result in other chronic gastrointestinal issues. Between episodes of acute SBO pain, I struggled with long stretches of minor discomfort, bloating, and bowel changes that seemed to be related to an SBO but never culminated in a severe episode of pain. After extensive research, I deduced that I may have been suffering from small intestinal bacterial overgrowth that, as the name implies, is an overabundance of what should be a thin layer of bacteria lining the inside of the small intestine. Those acquainted with probiotic research may think healthy bacteria should permeate the intestines; however, it is the large intestine that has evolved to house numerous species of billions of healthy bacteria and yeast. The small intestine works to cleanse itself of a buildup of microbes through the action of the MMC. There are many causes of bacteria overgrowth in the small intestine, but its natural cleansing is almost certainly interrupted by the presence of an SBO or scar tissue. The backup from even a minor episode of partial bowel obstruction has the potential to cause a buildup of naturally occurring beneficial bacteria and yeast. Small intestinal bacterial overgrowth is diagnosed by a breath test. The fasting patient is given a measured amount of a sugar syrup (glucose, lactulose, or both) and the amount of hydrogen and methane gas exhaled is measured at regular intervals. In my case, and despite my history of an SBO, I had to push my gastroenterologist to screen me for small intestinal bacterial overgrowth. He ultimately consented, and I tested positive. After a few months of treatment for small intestinal bacterial overgrowth, I saw clear improvement in the day-to-day symptoms of gastrointestinal distress; however, small intestinal bacterial overgrowth can be a recalcitrant condition, often recurring in susceptible individuals. My concern with patients living with an SBO is that they may be inherently susceptible due to the structural altering of their intestines. Although seeking a diagnosis of and treatment for small intestinal bacterial overgrowth may be warranted, treatment might only provide temporary relief. This challenges the patient to seek long-term care strategies to encourage a healthy gut ecosystem while also taking steps to minimize acute episodes of SBO that contribute to a vicious cycle of small intestinal bacterial or yeast overgrowth. Although the therapies discussed here are geared toward the prevention of SBO episodes, many will help ameliorate the side effects from an episode that may lead to small intestinal bacterial overgrowth. If the above strategies do not give relief from minor but regularly occurring gastrointestinal symptoms, one can turn to herbal formulas and conventional antibiotics used for the treatment of small intestinal bacterial overgrowth. However, these treatment protocols should only be prescribed by a licensed health care practitioner.